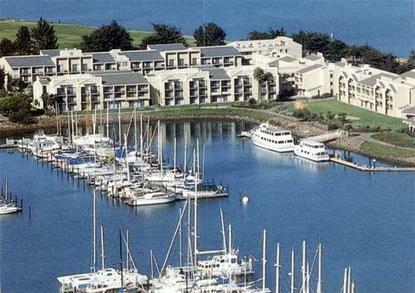 The Doubletree Hotel & Executive Meeting Center at the Berkeley Marina, a world-class, full service meeting and conference center overlooking San Francisco Bay, provides superior service in a resort-like setting. Our exceptional San Francisco hotel, certified by the International Association of Conference Centers (IACC), is 20 minutes from Oakland International Airport, and convenient to all major highways.The Luxurious Alternative to San Francisco HotelsBreathtaking views of the Bay Area, San Francisco skyline and Golden Gate Bridge usher guests into our elegant lobby. Our beautifully appointed guestrooms and suites include private balconies or patios, and are available with Berkeley Hills, Courtyard, or Marina views. Our 378 guest rooms include all the comforts of home, high-speed Internet access, and Sweet Dreams beds and are 100% non-smoking.A Hotel Close to San Francisco and Bay Area AttractionsOur dazzling location offers vacationers and business travelers endless leisure options. Unique San Francisco entertainment, shopping, dining and culture is only ten minutes away. Sacramento, Napa, Marin and Oakland are also nearby. From beach to golf course to mountain trail, our hotel guests have access to scenic beauty and dozens of outdoor activities. On-site hotel amenities include an indoor family pool and spa, indoor lap pool, well-equipped fitness center, and sauna. Enjoy the finest in California cuisine at our waterfront restaurant, Bay Grille, or relax with your favorite beverages and tranquil views in the Bay Lounge.Event Planning at our Hotel in San Francisco's Berkeley MarinaBusiness travelers and meeting planners experience the ultimate in productivity and comfort at the Doubletree Hotel and Executive Meeting Center (EMC). The EMC provides 8,000 square feet of dedicated, state-of-the-art meeting space. Our experienced technical support staff is available to assist with corporate meetings, conferences, training sessions or executive retreats. For your convenience, the hotel also provides a complete Business Center with complimentary high-speed Internet access, laptop station, printers, scanners, copiers and office supplies. For special events, banquets, receptions or social occasions, The Doubletree offers unrivaled surroundings, a top catering team, and elegant hotel space for parties of 10 to 500. Choose the expansive bayside lawn for a festive outdoor party, or our elegant ballroom for a formal affair. Business or pleasure, we ensure a flawless event.Ideal for business travel, family vacation, social event, or a luxurious romantic retreat, the Doubletree Hotel & Executive Meeting Center at the Berkeley Marina provides unparalleled accommodations in a picturesque location. Our caring, multi-lingual staff looks forward to welcoming you to the Bay Area with our very special, signature warm chocolate chip cookie at check-in.